and blackberries all grown here and sold direct from our farm shop. We press fresh, pure apple juice (using our own apples) regularly throughout each week. 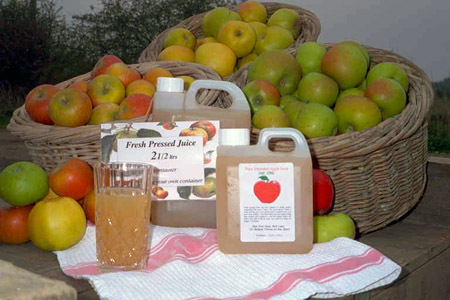 The pure apple juice is collected, fresh, direct from the press and immediately refrigerated ready for sale. Bring your own containers to fill, or buy containers from the farm. It is completely pure, and completely untreated, and has a fresh apple flavour unlike anything you will find in the shops. The juice lasts about 5 days in the fridge, after which the natural yeasts will begin to turn the pure juice into cider. If you wish to store the juice, it freezes very well. Single variety, as well as mixed variety apple juices are pressed, according to the variety of apples in season. The juice available for sale will therefore vary in flavour throughout the season. We will also aim to offer a blended juice to ensure a sweet, medium and sharp selection. July/August: single variety juices are likely to be Vistabella; George Cave; Discovery; and a blended juice. September on: juices likely to be Bramley/Cox blend, straight Cox, Russet, Red Pippin or a mix of other varieties. Since the juice is not pasteurised, it retains the rich flavour of the fresh apple, (unlike most other shop bought apple juices which obtain a 'stewed' flavour. The apple juice normally available to you in glass bottles has been heat treated, as has normally the 'fresh' juice in cartons available in supermarkets). Our juice therefore has a unique fresh flavour. Sometimes the fresh juice is clear, sometimes the juice is slightly cloudy. This cloudiness is merely fine apple solids which will settle out as sediment if left to stand. The juice can either be carefully decanted from the sediment for a clear juice, or if you prefer, the juice can be shaken before pouring. The juice can be bought in either 1 ltr or 2 1/2 ltr containers purchased on the farm, or we can fill your own containers which you have brought from home. The juice is suitable for freezing, and also suitable for home wine or cider making. If you require a large quantity of juice, it is best to give us a day or two days notice in advance to ensure we can make plans to press for your requirements. We also grow specific cider apples so if you want a quantity for cider making please get in touch. The fresh juice will keep for about 5 days in the fridge, (after which, the natural yeasts in the juice will start to ferment. The juice is still drinkable at this stage, and some find it a pleasant alternative. The increase in yeasts are also known to contain many beneficial nutrients). If you would like to see the juice press, please ask. We can press your own apples if required for a small fee, (minimum 45kg), please phone first to make the arrangement. For our own apple juice we only press our own good quality fruit picked from the tree, and do not use poor quality or fallen fruit. We press in very hygienic conditions. The juice room and equipment is meticulously cleaned and sterilised after each day of pressing. From New Year to July we are open 6 days a week, Mon to Sat, 9.00am-5.00pm. We are closed between Christmas Day and New Year's Day.